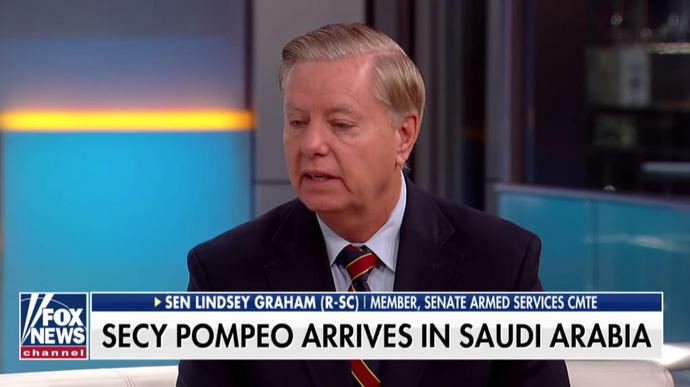 Sen. Lindsey Graham (R-S.C.) told "Fox & Friends" on Tuesday that he'll never work with Saudi Arabia's Crown Prince Mohammed bin Salman because he's a "wrecking ball." The senator said he would "sanction the hell out of Saudi Arabia" over the disappearance of Washington Post journalist Jamal Khashoggi. "I know this: Nothing happens in Saudia Arabia without MBS knowing about it," said Graham, abbreviating the crown prince's name. "He's the 33-year-old prince who jumped over people. He's the son of the existing king. I think he's on a bad track. I can never do business with Saudi Arabia again until we get this behind us." Graham told host Brian Kilmeade that he won't be "going back to Saudi Arabia as long as this guy is in charge." The senator said he's been the nation's biggest defender just before calling the Crown Prince "a wrecking ball." "He had this guy murdered in the consulate in Turkey and to expect me to ignore it? I feel used and abused. I was on the floor every time defending Saudi Arabia because they're a good ally," said Graham. Khashoggi has been missing since Oct. 2 after entering the Saudi consulate in Istanbul. While reports from Turkish officials appear to indicate that Khashoggi was murdered, President Trump has repeatedly told the press that Saudi Arabia denies any involvement with Khashoggi's disappearance. On Monday, Secretary of State Mike Pompeo flew to the country in an effort to gather more information about Khashoggi. Graham also implored Saudi Arabia directly to choose a new leader as the crown prince, to him, is "toxic" and "can never be a world leader on the world stage." "This guy has got to go. Saudi Arabia, if you're listening. There's a lot of good people you can choose, but MBS has tainted your country and tainted himself," said Graham. The South Carolinian also said that Saudi Arabia has "nothing but contempt" for the United States and that he's "personally offended" by their actions.